Liposomes are used for drug delivery due to their unique properties. A liposome encapsulates a region on aqueous solution inside a hydrophobic membrane; dissolved hydrophilic solutes cannot readily pass through the lipids. Hydrophobic chemicals can be dissolved into the membrane, and in this way liposome can carry both hydrophobic molecules and hydrophilic molecules. To deliver the molecules to sites of action, the lipid bilayer can fuse with other bilayers such as the cell membrane, thus delivering the liposome contents. By making liposomes in a solution of DNA or drugs they can be delivered past the lipid bilayer. There are three types of liposomes - MLV (multilamellar vesicles) SUV (Small Unilamellar Vesicles) and LUV (Large Unilamellar Vesicles). These are used to deliver different types of drugs. By varying the type of phospholipid used to make liposomes and/or by attaching certain molecules to the surface of liposomes, they can be engineered to have many useful properties. Liposomes that contain low (or high) pH can be constructed such that dissolved aqueous drugs will be charged in solution. As the pH naturally neutralizes within the liposome (protons can pass through some membranes), the drug will also be neutralized, allowing it to freely pass through a membrane. These liposomes work to deliver drug by diffusion rather than by direct cell fusion. 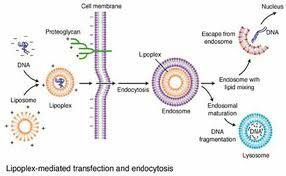 Another strategy for liposome drug delivery is to target endocytosis events. Liposomes can be made in a particular size range that makes them viable targets for natural macrophage phagocytosis. These liposomes may be digested while in the macrophage's phagosome, thus releasing its drug. Liposomes can also be decorated with opsonins and ligands to activate endocytosis in other cell types. liposomes can be used as carriers for the delivery of dyes to textiles, pesticides to plants, enzymes and nutritional supplements to foods, and cosmetics to the skin. Liposomes are also used as outer shells of some microbubble contrast agents used in contrast-enhanced ultrasound. Release their contents when they reach a specific temperature. 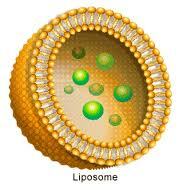 Target certain tissues or cell types by changing the types of lipids in the liposome. Target tissues, cell types or specific proteins by attaching antibodies to the surface. Avoid certain tissues or cells by attaching complex sugars to the surface. Evenly distribute fat-soluble (oil-like) compounds such as certain vitamins, antioxidants, antibiotics, flavors, etc. which often can't be mixed in water-based products including most foods. Fuse with cells, which is important in delivering DNA to a cell. Serve as model cell membranes making it easier to study specific cellular processes and how certain molecules, such as drugs, interact with cells. Protect compounds from acidic and enzymatic degradation in the stomach and intestine by using certain molecules to coat the liposome. Protect compounds such as vitamins and antioxidants from premature oxidation for increased shelf-life. Enhance the intestinal absorption of compounds by coating with certain molecules. Carry drugs across the nasal mucosa (nasal drug delivery). Deliver drugs directly to lung tissue by inhalation of the liposomes. Carry fluorescent dyes or other types of molecules which allow the liposomes to be tracked in the system to which they are added.